Description: Over the past forty years, Finnish artist and technology pioneer Erkki Kurenniemi (b. 1941) has been a composer of electronic music, experimental filmmaker, computer animator, roboticist, inventor, and futurologist. Kurenniemi is a hybrid -- a scientist-humanist-artist. Relatively unknown outside Nordic countries until his 2012 Documenta 13 exhibition, "In 2048," Kurenniemi may at last be achieving international recognition. This book offers an excavation, a critical mapping, and an elaboration of Kurenniemi's multiplicities. The contributors describe Kurenniemi's enthusiastic, and rather obsessive, recording of everyday life and how this archiving was part of his process; his exploratory artistic practice, with productive failure an inherent part of his method; his relationship to scientific and technological developments in media culture; and his work in electronic and digital music, including his development of automated composition systems and his "video-organ," DIMI-O. A "Visual Archive," a section of interviews with the artist, and a selection of his original writings (translated and published for the first time) further document Kurenniemi's achievements. 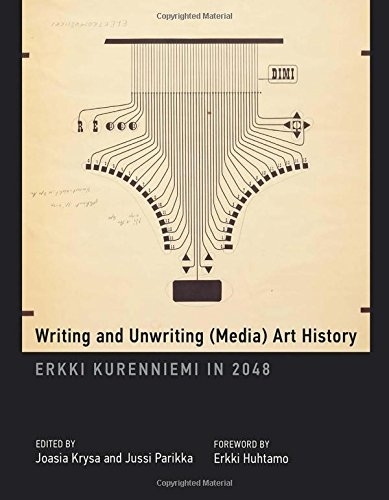 But the book is not just about one artist in his time; it is about emerging media arts, interfaces, and archival fever in creative practices, read through the lens of Kurenniemi. Author Biography: Joasia Krysa is Artistic Director of Kunsthal Aarhus, Adjunct Associate Professor at Aarhus University, Denmark, and was part of the Documenta 13 curatorial team. She is coeditor of DATA browser book series and author of Curating Immateriality. Jussi Parikka is Professor of Technological Culture and Aesthetics at University of Southampton's Winchester School of Art and Docent in Digital Culture Theory at the University of Turku, Finland. He is the author of What Is Media Archaeology? and other books.